apron1, originally uploaded by All Things Mimi. This is the apron I made my Mom for her birthday. I suppose it's a good thing she doesn't read the blog, or I'd have just blown the big surprise! 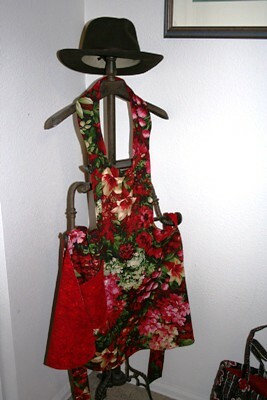 It's actually my second apron, but the first reversible one. There isn't a single straight seam in the whole thing, and the floral side looks way better than the solid red side. But on the whole, I was pretty happy with the way it turned out. I added some buttons where the yolk attaches to the body of the apron, both for visual appeal and to cover my horrible seaming job. Anyhoo, I hope she likes it and thinks of me when she wears it!